Cosmetic company, SkinCure, Inc. (CEO Myeongok Kim) which represents Jeju island participated 'Aesthetic Asia 2012 Exhibition' held at the Marina Bay Sands that is a landmark of Singapore and introduced the professional cosmetics that can use in cosmetic dermatology and Esthetic Spa of all of Asia, etc . Singapore Aesthetic Asia Expo which is held as 4th time in this year, as an exhibition to lead the paradigm of international plastic surgery and beauty equipment industry, including the United States and Europe, 120 companies among 30 countries were participated. And the professionals in plastic surgery, dermatology and dental and esthetic industry were participated and had various meetings and conferences. SkinCure, Inc. introduced the stem cell cosmetic brand StemCello and a comesutical cosmetic brand TALS. 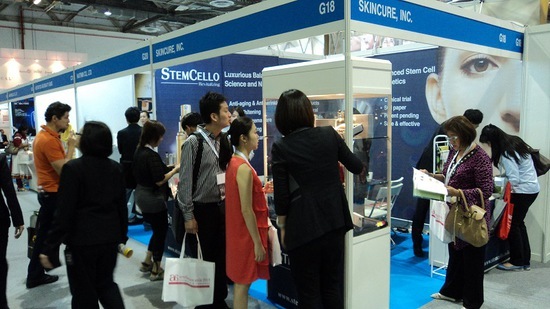 While introducing each product of 2 brands SkinCure, Inc. gained tremendous interest, by suggesting a scientific research result during the development process and final production and clinical result, even it is introduced in this fair for the first time. The 3 kinds of ampoule target such as whitening, anti-wrinkle and anti-aging of TALS brand gained popularity to provide even the exhibition samples. During the exhibition period, various discussions was made through the booth meeting with aesthetic and cosmetic companies from Singapore, Malaysia, India, China and Iran etc, total 41 related companies have visited our booth and had meetings. Among them SkinCure, Inc. has developed the possibility of export with 12 companies so it is making a bright business relationship. Since SkinCure, Inc. has moved the headquarter in Jeju island in 2007, currently resides at the Jeju Techno Park (Director Han youngseop), runs a factory and laboratory and has been growing steadily as the representative company of Jeju cosmetics. SkinCure, Inc. expressed gratitude for a good result from this fair by participating with the part of support of Jeju island.